The US 281 Truck And Trailer Services LLC FAQ page would answer all your Truck and trailer repair and service queries. ANSWERS TO ALL YOUR QUERIES ABOUT US 281 TRUCK &AMP; TRAILER SERVICES LLC EDINBURG, TEXAS... (956) 783-8991 Call us now ! Do you have room in your shop for a trucks & trailers? What is the price for a complete oil change? Do you offer Truck, Trailer, Boat, and RV Storage? We offer storage for any type a vehicle for a long as needed. Daily rate, monthly, weekly, or yearly. What’s your rate for storage? We have daily, weekly, monthly, and yearly. Do you weld Aluminum, Stainless Steel, and steel? We do all aluminum, steel, and stainless steel. We are able to weld all metal. Our welder has 15 years experience and is has his certifications. We are also insured for all jobs. How much is a brake job for one trailer axle? Brake job on one axle is $150.00. That does not include wheel seal, cam bushings, slack adjusters, or air chamber. Its just removing tires, removing drums, removing brakes and brakes kits. Install new brakes and spring kits. Adjust brakes. We inspect all brake system parts, then advise customer on findings. What do you charge to remove and replace radiators? We charge $95.00 an hour. Most radiators take from 2 to 4 hours depending on the radiator, the make of the truck. Do you have an a/c recycle machine? 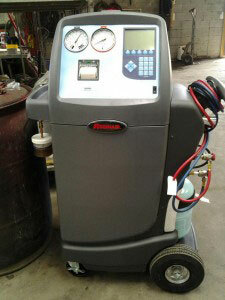 We have our new a/c Freon recycler. What kind of oil do you offer on the oil change? Do you straighten bent chassis on trucks? We straighten bent chassis and added frame to make longer. We have stretched about 200 trucks since we opened. Do you stretch chassis on trucks? We can stretch chassis to any length desired. We reinforce chassis with inside L’s. Swing by for a quote. Do you change front leaf spring bushings? We do change leaf spring bushings. We need the truck in our shop for at least 8 hours. It’s a one day service. We special press in copper bushing if kit comes with copper bushings. We also inspect all brake since we have to remove all brake system. We have to inspect all shackles for wear. Make an appointment. Do you change king pins on steering axle? Yes, we need a complete day to be able to replace king pins on steering axle on both sides. We will remove all parts, inspect, and replace needed parts. We will use a special press to install brass pins. Do you work on car haulers? Yes we work on car haulers. We have all special tools to be able to service low profile trucks. We do hydraulics and lots of welding on structure of truck and trailers. Do you recommend new or rebuild clutches? We install about 15 clutches every month. We have about half of the customer install new clutches. The other half do rebuild. It really depends on the customer and the application. All are good, there is also self adjusting and easy pedal. When installing a clutch we inspect input shaft on transmission and rear main seal. We always remove and cut flywheel for warranty purposes. What does a clutch job cost? Clutch jobs average a cost of $1200 - $1650 depending on whether it is a new or a re manufactured (re-man) clutch. We inspect input shaft, flywheel cut, motor mounts, clutch linkage, rear main seal etc. Test Drive to make sure all works properly. Do you do DOT commercial or state inspections on trucks, trailers, motorcycles, and cars ? Do you work on Recreational Vehicles? We work on all vehicles. We repair boat trailers, RVs, drop deck trailer. If its got a engine and a brake system we can definitely help you with your vehicle. Do you do pull starts? We do pull start. They are very common in the winter because of the cold. Any time of the day, we have several vehicles that can go and do a pull start. What’s your warranty on your labor? Most warranty vary from 3 months to 3 years depending on service. Examples: A new water pump has 3 months. A complete overhaul has 3 years warranty. Frame extensions have 3 years warranty. What do you check when a truck is overheating? When a vehicle arrives and its been heating up. First, we check for any water hoses leakage. Second, we check radiator. Third, we check air to air. We have several items we check next. Do you do computer diagnostics? We have computer diagnostics in CAT, Cummins, and Detroit 60 Series. Do you sell aluminum fuel tanks? We stock several different sizes. Can you reprogram my Kenworth so it can run past 65 mph? Yes, any engine Cat, Cummins, and Detroit. We can see your miles per gallon. We can adjust your mph. IN CASE YOU'RE QUERY IS NOT IN THE LIST PLEASE CALL US AT (956) 783-8991 OR FILL IN THE FOLLOWING QUERY FORM. & Road Service is 24 hrs. US 281 Truck & Trailer Services LLC | 101 Pennzoil Loop South, Edinburg, Texas 78542, USA, PH: (956) 783-8991 | Google+ We provide road service and service trucks , trailers and all other commercial vehicles in the entire Rio Grande Valley including Rio Grande City, Harlingen, McAllen, Edinburg, Alton, Palmview, Pharr, San Juan, Alamo, Mercedes, Weslaco, San Benito, La Feria, San Manuel, Encino, McCook, and Falfurrias. Copyright © US 281 Truck & Trailer Services LLC. All rights reserved.